Note: Keck Graduate University is not currently included on tour. 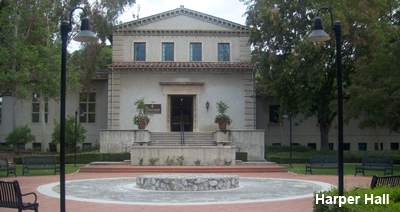 Founded in 1887, Pomona College is a premiere liberal arts college with a focus on the arts, humanities, social sciences and natural sciences. 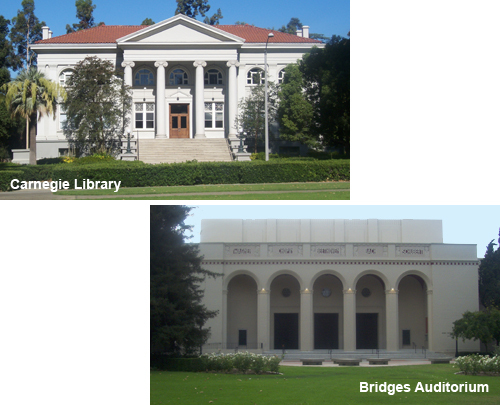 This concert hall, designed by Pasadena architect Myron Hunt, was a gift of Mr. and Mrs. Appleton Bridges of San Diego, whose daughter died in 1907, a year before her graduation from Pomona College. Hunt chose a style that included classical elements in a Roman Basilica exterior and an interior noted for its beautifully painted wood-beamed ceiling reflective of the Mexican heritage of this area. 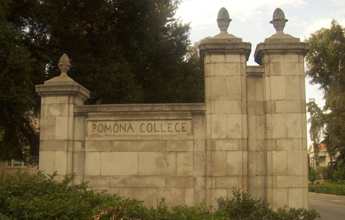 Hunt went on to lay out the plan for the Pomona College campus. This Art Deco concert hall, called “Big Bridges” to distinguish it from Bridges Hall of Music, was a second gift from the family of Mabel Shaw Bridges. 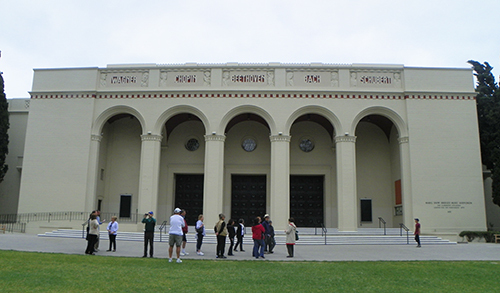 For many years it was the largest concert hall east of Los Angeles, seating 2,500. It is the eastern anchor of Marston Quadrangle, one of the beautifully landscaped green spaces that mark all of the Claremont Colleges. This auditorium is shared by all the Colleges and is used for some theatrical productions, graduations, and concerts. Phone (909) 621-8032. 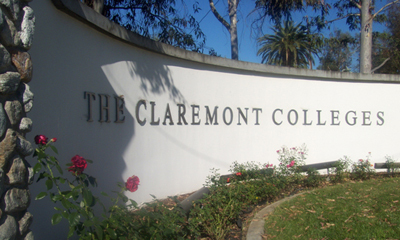 Founded in 1925, Claremont Graduate University is a private, graduate-only institution which offers small class sizes. 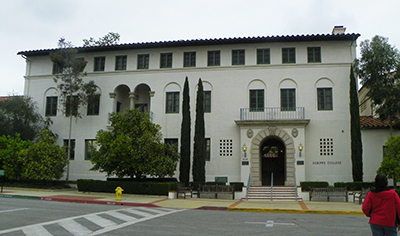 This imposing building was designed by Gordon Kaufman as the administrative headquarters and classroom building for Claremont Graduate University. It is named after Jacob Harper; advisor of Ellen Browning Scripps, who donated the money for this building and most of the money for the land which has allowed all the newer campuses to be built. 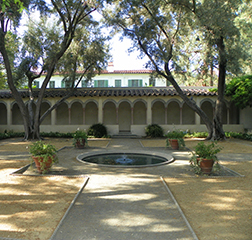 Just south of this building is a fountain and pergola dedicated to James Blaisdell, founder of the Claremont Colleges plan. 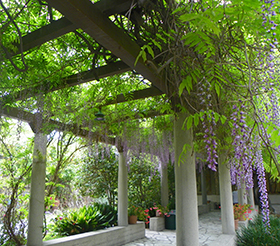 Each column of the pergola bears a quotation of Blaisdell’s illustrating his vision and world view. Its bubbling fountain and shady bench offer a nice spot to rest and relax. 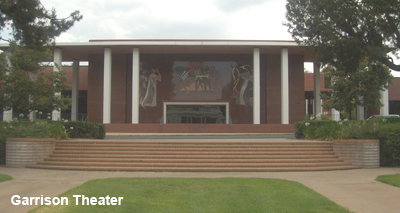 The distinctive mosaics on the facade of this 750-seat auditorium were created by Millard Sheets, art professor at Scripps and the Graduate University, who is best known for the tile mosaics he designed for Home Savings and Loan. He designed this building with David Underwood. The facility is shared by all the colleges. 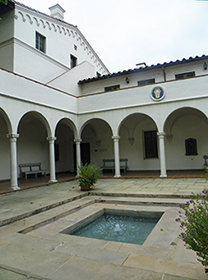 Founded in 1926, Scripps College is a nationally top-ranked private liberal arts college for women. Balch Hall is the formal entrance to Scripps and its administrative center; designed by architect Sumner Hunt to fit into the overall plan of the campus, which was designed by Gordon Kaufman. The informality of this Mediterranean style is matched by the easy movement from interior to exterior spaces in this building with its beautiful courtyards. This small, walled garden contains olive and orange trees and interior arcades, one of which is covered by an enormous wisteria vine. 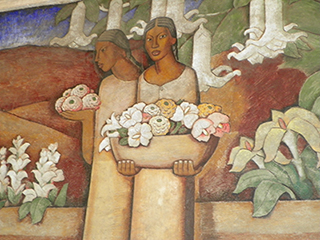 On one wall is a fresco painted in 1946 by Mexican muralist Alfredo Ramos Martinez, who died before its completion. 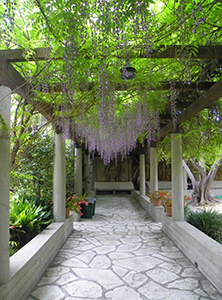 The garden was a gift in memory of Margaret Fowler; a local philanthropist who started a rehabilitation program for children with nerve and brain damage at her home, called Casa Colina. 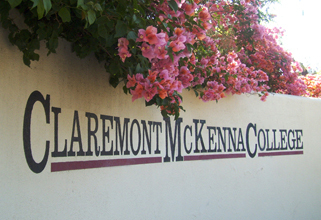 Founded in 1946, Claremont McKenna College is a private, coeducational, undergraduate liberal arts college. 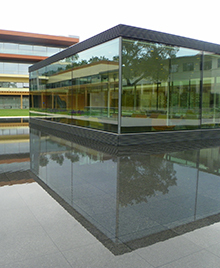 The first structure built for Claremont McKenna College, this hall was named after a major donor; Russell Pitzer; who would also make generous donations to Harvey Mudd College and have Pitzer College named after him. Its simple yet dignified design was created by architect George Allison, whose uncle, David Allison, set up the plan of the campus. 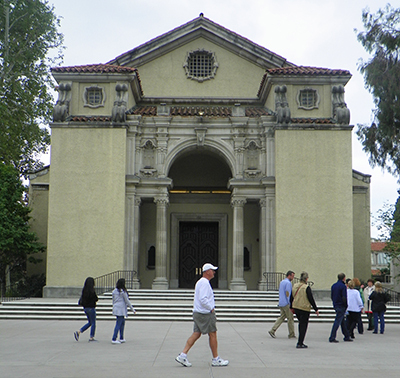 It is sympathetic to the Mediterranean style of Scripps College to the north and to the dormitories of Pomona College to the south. A unique program at CMC gave rise to this very attractive and much used modern structure designed by Quincy Jones. Believing that students would benefit from a more personal and informal interaction with professors and distinguished visitors to the campus, CMC built this athenaeum, which offers a dining room and meeting rooms for small group encounters and lectures that are often open to the community at large. 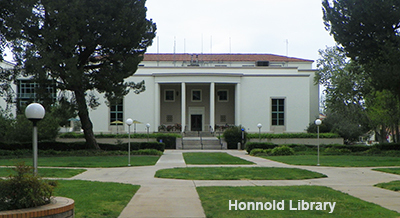 Founded in 1955, Harvey Mudd College is a private liberal arts college focusing on mathematics, the physical and biological sciences, and engineering. 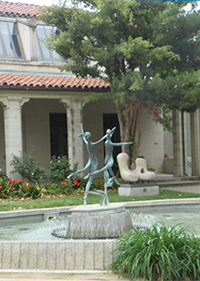 Here is a sculpture brought to Claremont from Italy by Thomas Church, who landscaped the Harvey Mudd campus. It is by Giovanni Bologna (1552-1608), a major sculptor of the Italian Renaissance. 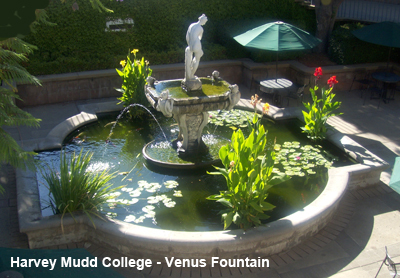 The fountain is a symbol of the commitment of this engineering and scientific college to a foundation in the humanities and social sciences. 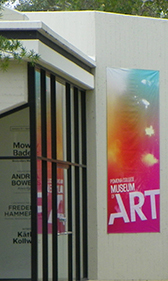 Founded in 1963, Pitzer College is an undergraduate college of the liberal arts and sciences. On Mills Avenue; Accessible from the Eastern Terminus of Twelfth Street Scott Hall was named for Russell Pitzer’s second wife, Ina Scott Pitzer, and was for many years the central administrative building for the campus, with classrooms and faculty offices. Many of these functions have been moved recently to the Eli Broad Center. 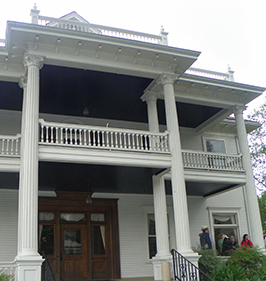 This craftsman bungalow was once set in the middle of an orange grove on Harrison Avenue in Claremont, and was moved to the Pitzer campus in 1977 as a warm, inviting campus center and coffee house for students and faculty. The landscaping around the building is outstanding, as faculty and students have planted a small grove, a desert garden, and a native habitat.